← Mornings can be challenging under the best of circumstances! July 21, 2011 – N.E.A.T. 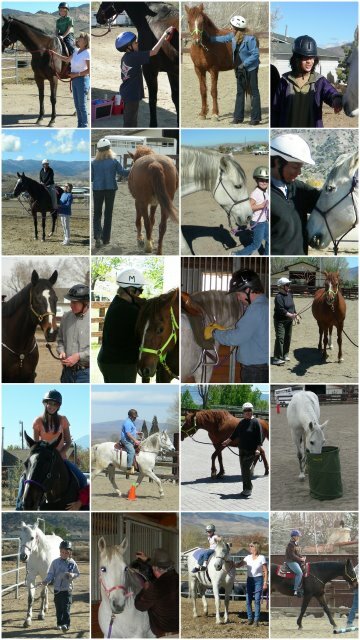 – Nevada Equine Assisted Therapy announces that, in partnership with Community Chest, Inc. of Virginia City, they will be hosting the Comstock Youth Works program. These high school students will participate in a ranch day on August 3rd from 9:00 a.m. to noon. The Comstock Youth Works program assists traditional high school students with significant life and/or academic challenges. The summer program focuses on building life skills, gaining occupational experience and earning academic credit. As a part of their weekly career exploration field trips, this group of 20 youth will visit N.E.A.T. to learn about the unique field of equine assisted therapy, as well as a variety of other equine related careers such as horse care & ranch management, the Ferrier business and large animal veterinary field. Invited to participate are Tyler Brady, DVM, of Mountain View Large Animal Services, who will discuss his veterinary practice working with horses and cattle in Northern Nevada; and Justin Geney, of Geney Farrier Service, who will discuss his work as a horse Farrier (someone who shoes horses for a living). Nevada is a large ranch state with numerous job opportunities working with horses and cattle. During their visit they will learn a little about these two lucrative careers from practitioners. Additionally, N.E.A.T. personnel will discuss the burgeoning field of Equine Assisted Therapy. For reasons that may forever remain unknown, the horse holds a special captivation and power that none of us ever out-grows. The youth’s will see a live demonstration with the horses, and learn more about how horses can make a difference in our lives – even heal us – for an array of social, emotional and behavioral conditions. N.E.A.T. – Nevada Equine Assisted Therapy is a new and innovative program that provides social, emotional and behavioral growth and development through work with horses. The program works with individuals as young as 4 years old to teens, adults and seniors. N.E.A.T. provides services to individuals, as well as couples, families, siblings and small groups. For additional information about N.E.A.T. visit our website at: www.NevadaEquineAssistedTherapy.com. Or feel free to call us at 775-473-5548 or email us at: NEATinfo@yahoo.com.